The aim of the mini project is to implement the path finding game. The Path finding game containing a rectangular maze of any shape and size in which the horizontal and vertical lines represent the walls of the maze. 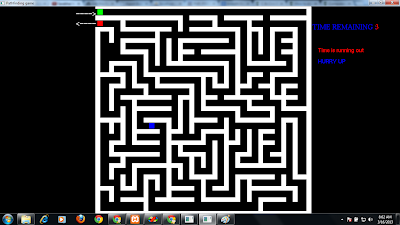 Path finding game can be made difficult or easy, that is depend upon the maze. Maze can be implemented as in 2D, 3D or more higher dimensions. This game is very popular as puzzle solving. Hence it can be used as an effecting tool for logical reasoning and mental aptitude. 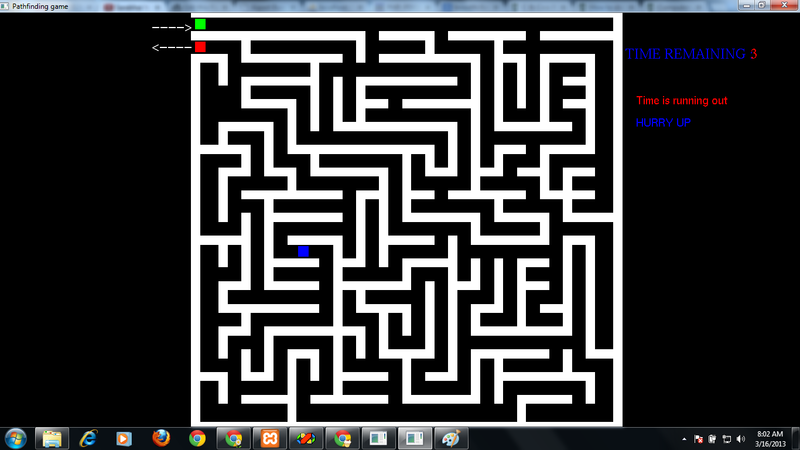 Our project title is “Implementation of path finding game”. What this means is that we are building a maze of any shape and size and search for a path through it. So, our goal is to create a Perfect Maze. More specifically, the maze we are building is a 2-Dimensional of fixed shape and size, in which the horizontal and vertical walls are connected in such a way, so that the point can move from given starting point to the ending point through the spaces formed by connecting walls, but point should never cross the wall. The main working of path finding game is to find out the path from given place to another place by using the movement of point. We use the special key button for the movement of point. The left key button is used to movement of point along the X-axis as the value decreases, The right key button is used to movement of point along the X-axis as the value increases, The up key button is used to movement of point along the y-axis as the value increases, the down key button is used to movement of point along the y-axis as the value decreases. There is also be given the time limitation, so it is necessary to find out the path within a given time interval. Pay with Paypal $6* only! * call 8147656011 or 9945831394 for any query! Can you plz send me the code of the above? sir we use eclipse helios in our coll with opengl installed in it. our coll os is ubuntu. and its not working. 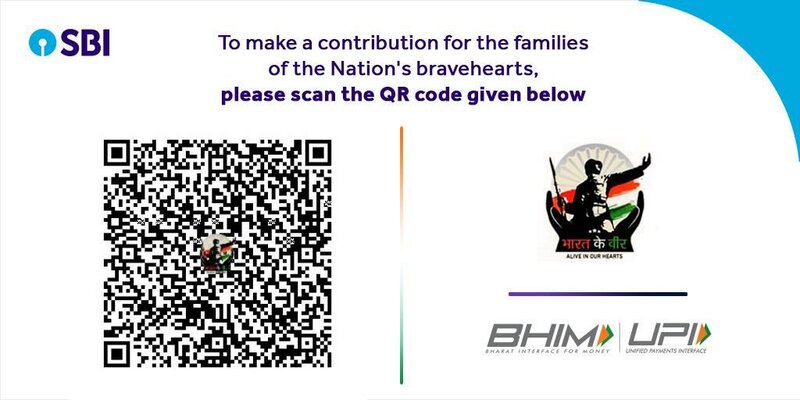 pls suggest the changes to be made in the program. hi sir..can u plz suggest me the latest topics of cg projects..as i m new t this project world m not getting what u chose,how to chose...? and my mail id is "shrungakrishna@ymail.com"
how will i get the code after the payment is done??? will it come in my email or in my address?? yeah through the email only! WHIRLPOOL OF COLORS is nice project and i can't give you whole project code untill it is with me so....... you have try to focus on other coding part as in case i already given main logic and the code for it.